The head, arms and legs are most often injured in a motorcycle crash. So while it may be easy to remember to grab your helmet on the way out the door, riding boots can be an afterthought. 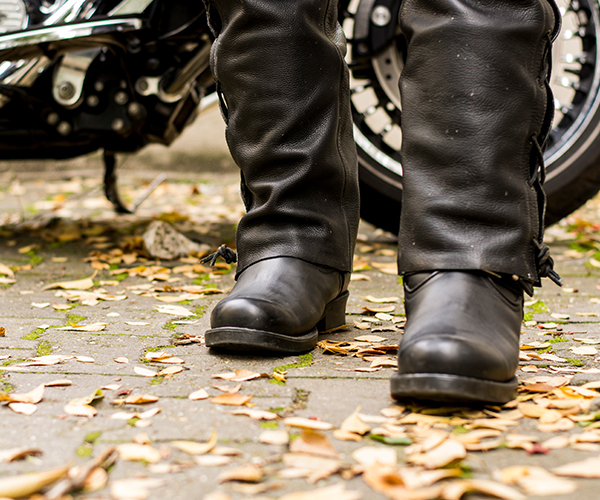 Don’t overlook the importance of the right pair of boots to wear when on your motorcycle. Heavy-duty motorcycle boots may seem heavy, overrated and expensive. But they’re essential to protect your feet from the hazards of the road when riding. When your motorcycle comes to a stop, you’re not only supporting your own weight, but also the weight of hundreds of pounds of metal beneath you. If you ever lose control on your bike, instinct kicks in (literally), and you react by sticking your feet out to stabilize yourself. That’s why it’s critical to wear shoes with adequate ankle support and traction to grip the road and keep feet secure. Riding boots protect ankles and prevent open wounds and extreme twisting in case of a crash. Your feet are also exposed to varying weather conditions when you ride. To ensure comfort, it’s important to wear boots that are waterproof to protect you from cold temperatures but also have good ventilation so your feet can breathe when the weather is warm. A lot rides (pun intended) on the pair of boots you choose to wear on your motorcycle. They have to protect a major part of your body, be comfortable enough to wear all day and, of course, be stylish. Some of the fun of riding is dressing the part with your gear. A pair of heavy-duty leather boots completes the perfect bad-to-the-bone look while being practical at the same time. Have fun when choosing the style of boot that suits you, as long as you check that they have the proper protection.